Choose Great, Win Great! Promo ~ Philippine Freebies, Promos, Contests and MORE! If you win P3 million, what would you do? Start listing down your plans and submit your entries in the Great Taste White Choose Great, Win Great! Promo. Collect 1 empty wrapper of Great Taste White BigSAVE Pack or 5 empty wrappers (any combination) of Great Taste White sachets (3in1, Smooth & Chocolatey 3in1, Smooth & Caramelly 3in1, 3in1 Sugar Free). Place it in a plain white envelope together with your contact details written in a piece of paper. Don't forget to label it with "Great Taste White: Choose Great, Win Great Raffle Promo". 1 envelope qualifies for 1 entry only. There will be 4 Regional Draws in GMA, North Luzon, South Luzon, Visayas and Mindanao and 1 National Grand Draw. Submit as many entries as you can for more chances of winning P3 million cash or White Toyota Vios 1.3 E M/T in the Grand Draw. Regional Draw winners will also take home P200,000, P100,000, white MacBook Air, white iPhone 6, and white iPad Mini. Place the paper inside a plain white envelope together with the required number of Great Taste White wrappers. 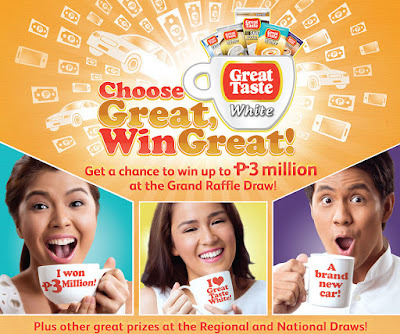 Label it with "Great Taste White: Choose Great, Win Great Raffle Promo"
The Regional and Nationald Draws will be conducted with fairness and shall be witnessed and verified by Food and Drug Administration (FDA) representatives.